Masahiro Shinoda once worked under Ozu as an assistant director (Tokyo Boshoku). During the shooting, there was a sitting cushion placed on the tatami floor in the set, which was never used by any of the characters in the scene. He asked Ozu what was the meaning of that cushion. Ozu invited Shinoda to the view finder of the camera. “What do you see?”, he asked. There were lines and lines of tatami edge (hen) covering the lower half of the frame. 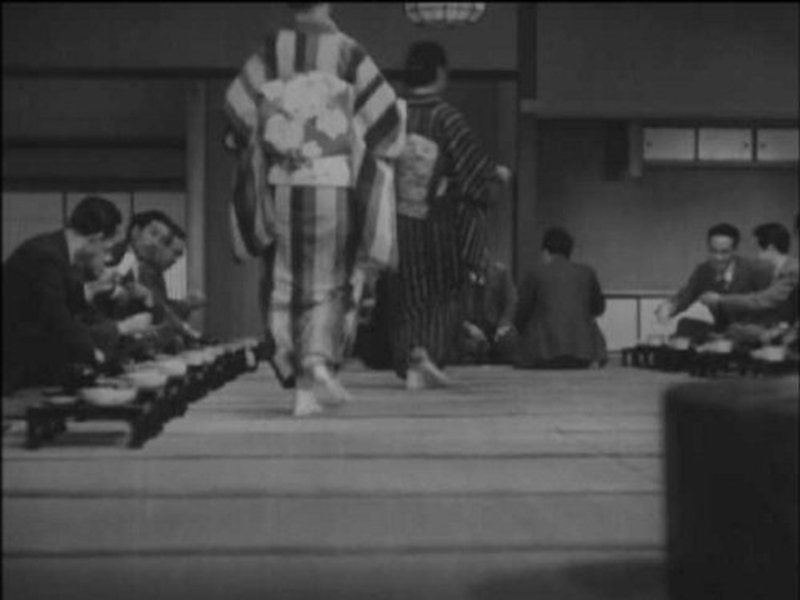 Ozu did not like the tatami edges invading his composition and the cushion was placed to conceal them. The large space of reunion gathering is cunningly designed as its tatami edges lined up in parallel. As the position of the camera being lowered, it becomes increasingly cumbersome to compose a medium to long shot without tatami occupying the large part of the lower frame. To lessen the heaviness of the geometrical patterns, the parallel lines must have been conceived. There is another Japanese film director who was noted for very low positioning of the camera. Tai Kato directed many Yakuza films during sixties and seventies. His stories are usually set in Meiji era, during 19th century to early 20th century. As the film historian Tadao Sato noted, Kato’s approach to low camera positioning is extreme, and quite differnt from Ozu’s. He incorporates tatami into his design effectively. Traditional gambling in Japan is usually staged in a large room and games are played on tatami. Cards, dice, cash and playing hands are all exchanged over the pale yellow of straws. Kato emphasizes the role of tatami as a battleground of gambler’s souls, something sacred and noble. It is a geometrical plane of honor, and trespassing this rectangle with secular greed and ego will mean blood. Though Ozu was as careful as Kato to approach this Japanese architectual design, he defined this space as quiet as possible. It is not a battleground, it is the plane of nonentity. The reunion sequence is the long steady uphill to the climax of the film. As I have described in the earlier post, there is some additional scenes in the original. This “lost” footage makes this uphill all the more critical. This will be the last night for the elder Horikawa, last reminder of his life as a passage of “doing as much” as he could. The “lost” footage found in the Gosfilmofond print contains the performance of “SEIKI NO UTA” by the elder Horikawa. This was the swan song by Commander Hirose, the “Troop God”. Now, this is going to be the Horikawa’s swan song. The analogy leads to the notion “doing as much as he can” by an ordinary man equals the great military achievement.